A fusion of DBA rules and DBR army lists. It plays like DBA so 'newbies' can pick it up at one sitting. On the up side that means the number of players can increase rapidly. On the down side they perhaps lack a true 'renaissance' flavour. Still it's early days yet and at only 12/13 elements per army worth an experiment or two. Try FADBAG (Yahoo Group) for the rules and separate army lists.....and an index for the Army Lists (made by TLM on 11.7.14). Following the 'ancients' schism Field of Glory (commonly referred to as FOG) & DBMM fought for primacy. 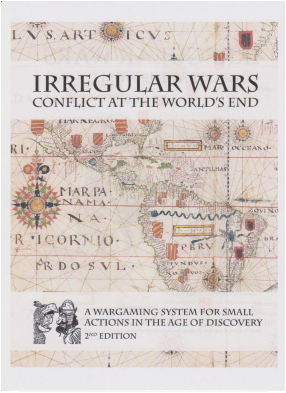 It seems to me that they both lost out with wargamers increasingly looking at other periods. Our club tried out FOG (Ancients) and disliked them. However, the FOG Renaissance rules do have a few followers. 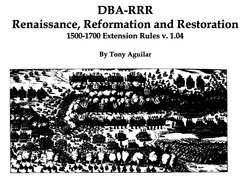 New World DBA - a less Euro-centric approach to the Renaissance period. 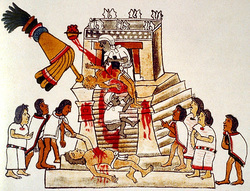 Initially concerned with Spanish versus Aztecs conflicts the set expanded to cover other Meso-American groups. DBA factors are altered to take account of 'native' fears of horses and guns. The Auxilia category is largely forgotten in favour of classifying troops as, mostly, blades or shooters. 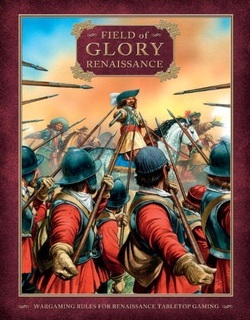 If you field an entirely Spanish (or other European) army the game will be quickly over. If you are more 'historical' the European elements will be in a minority giving a much more satisfying and interesting battle. This set is neither centred on Europe nor the New World. It is meant to cover small wars on the fringes of 'civilisation'. Emphasis is on maintaining cohesion and morale. Version 2 came out in December 2014 either as a pdf or book [link]. Much expanded with army lists and optional cards. Have had one try out but found the layout somewhat confusing.